For two-semester/three-quarter courses in General, Organic, and Biological Chemistry, primarily for majors in Allied Health, and occasionally in Environmental Technology, Agriculture, and other majors. Having secured the loyalty of both instructors and students, this best-selling, highly student-oriented text offers clear and concise use of language, thoughtful attention to problem-solving, and engaging discussions of relevant applications. Readable without sacrificing depth of content, it effectively covers the essentials of allied health chemistry without becoming bogged down in excessive and unnecessary detail, and puts chemistry in the context of everyday life. Maintaining interest and promoting student confidence, it offers a relaxed and friendly writing style that is highly accessible to the student with no scientific background and encourages analytic skill-building throughout with numerous problems, worked-out examples, and conceptual exercises. For two-semester/three-quarter courses in General, Organic, and Biological Chemistry, primarily for majors in Allied Health, and occasionally in Environmental Technology, Agriculture, and other majors.Having secured the loyalty of both instructors and students, this best-selling, highly student-oriented text offers clear and concise use of language, thoughtful attention to problem-solving, and engaging discussions of relevant applications. Readable without sacrificing depth of content, it effectively covers the essentials of allied health chemistry without becoming bogged down in excessive and unnecessary detail, and puts chemistry in the context of everyday life. Maintaining interest and promoting student confidence, it offers a relaxed and friendly writing style that is highly accessible to the student with no scientific background and encourages analytic skill-building throughout with numerous problems, worked-out examples, and conceptual exercises. This textbook is designed to put chemistry in the context of the allied health sciences as well as the other disciplines in which an understanding of the fundamentals of chemistry and of living things is valuable. The coverage in this fourth edition has been developed with considerable input from the many instructors and students who have used our previous three editions. To teach chemistry all the way from "What is an atom?" to "How do we get energy from glucose?" is a challenge. Throughout our general chemistry and organic chemistry coverage, the focus is on concepts fundamental to the chemistry of living things, and illustrations are drawn from this chemistry wherever practical. In our biochemistry coverage we strive to meet the further challenge of providing a widely useful overview. Our goal is to provide enough detail for thorough understanding while avoiding so much detail that the students are overwhelmed. The material covered is ample for a thorough, two-term introduction to general, organic, and biological chemistry. This edition retains our unique and well-received integrated biological chemistry sequence (described in greater detail below), which allows for the highest possible degree of flexibility. By varying the topics covered and the time devoted to them, the focus of the course can be adjusted to meet the needs of each instructor's student population and the duration of the course. Students in this course have their sights set well beyond academic concerns and the laboratory bench. They want to know why: Why must I study the gas laws? Why are molecules important to me as a nurse, soil scientist, or nutritionist? To engage these students in the subject matter, we write in a clear and direct style. We also provide straightforward diagrams, modem molecular models, and thoroughly explained solved problems. General Chemistry: Chapters 1-11. The introduction to elements, atoms, the periodic table, and the quantitative nature of chemistry (Chapters 1-3) is followed by chapters that individually highlight the nature of ionic and molecular compounds (Chapters 4 and 5). The next two chapters discuss chemical reactions and their stoichiometry, energies, rates, and equilibria (Chapters 6 and 7). Topics relevant to the chemistry of life follow: Gases, Liquids, and Solids (Chapter 8); Solutions (Chapter 9); and Acids and Bases (Chapter 10). Nuclear Chemistry (Chapter 11) closes the general chemistry sequence. Organic Chemistry: Chapters 12-17. These chapters concisely focus on what students must know in order to get on with biochemistry. The introduction to hydrocarbons (Chapters 12 and 13) includes the basics of nomenclature, which is thereafter kept to a minimum. Discussion of functional groups with single bonds to oxygen, sulfur, or a halogen (Chapter 14) is followed by a short chapter on amines, which are so important to the chemistry of living things and drugs (Chapter 15). After introducing aldehydes and ketones (Chapter 16), the chemistry of carboxylic acids and their derivatives (including amides) is covered (Chapter 17), with a focus on similarities among the derivatives. Biological Chemistry: Chapters 18-29. Rather than proceed through the complexities of protein, carbohydrate, lipid, and nucleic acid structure before getting to the roles of these compounds in the body, structure and function are integrated in this text. Protein structure (Chapter 18) is followed by enzyme and coenzyme chemistry (Chapter 19). After that we cover the function of hormones and neurotransmitters, and the action of drugs (Chapter 20). With enzymes introduced, the central pathways and themes of biochemical energy production can be described (Chapter 21). If the time you have available to cover biochemistry is limited, stop with Chapter 21 and your students will have an excellent preparation in the essentials of metabolism. The following chapters cover carbohydrate chemistry (Chapters 22 and 23), then lipid chemistry (Chapters 24 and 25). Next we discuss nucleic acids and protein synthesis (Chapter 26). The most significant addition of content in this edition is the new Chapter 27 on Genomics. The mapping of the human genome has opened the door to a revolution in our understanding of health and disease. Our chapter on genomics is designed to give students an appreciation of this ongoing revolution and sufficient background to understand its future impact on their chosen fields of endeavor. The last two chapters cover protein and amino acid metabolism (Chapter 28) and provide an overview of the chemistry of body fluids (Chapter 29). In this text, nutrition is not treated as a separate subject, but is integrated with the discussion of each type of biomolecule. Worked Examples. Most Worked Examples, both quantitative and not quantitative, now include a new Analysis section that precedes the Solution. The Analysis lays out the approach to solving a problem of the given type. In numerical worked examples, a Ballpark Check that follows the Solution replaces the Ballpark Solution of the previous edition. In this location, it can be used to validate the answer obtained. New Key Concept Problems are integrated throughout the chapters to focus attention on the use of essential concepts, as do the Understanding Key Concepts problems at the end of each chapter. Understanding Key Concepts problems are designed to test students' mastery of the core principles developed in the chapter. Students thus have an opportunity to ask "Did I get it?" before they proceed. Problems. The problems within the chapters, for which brief answers are given in an appendix, cover every skill and topic to be understood. One or more problems, many of which are new to this edition, follow each Worked Example and others stand alone at the ends of sections. More color-keyed, labeled equations. It is entirely too easy to skip looking at a chemical equation while reading. We have extensively used color to call attention to the aspects of chemical equations and structures under discussion, a continuing feature of this book that has been judged very helpful. Molecular models. Additional computer-generated molecular models have been introduced and the use of electrostatic-potential maps for molecular models is new to this edition. Key Words. Every key term is boldfaced on its first use, fully defined in the margin adjacent to that use, and listed at the end of the chapter. These are the terms students must understand to get on with the subject at hand. Definitions of all Key Words are collected in the Glossary. End-of-Chapter Summaries. Here, the answers to the questions posed at the beginning of the chapter provide a summary of what is covered in that chapter. Where appropriate, the types of chemical reactions in a chapter are also summarized. For those studying chemistry for the first and perhaps the only time, chemistry may not initially appear exciting. These students benefit from increased emphasis on the relevance and applications of chemistry. In this book, we carefully balance the ,need for solid science with the need for interesting examples and connections. Used with its text the workbook probably accomplishes the task the authors intended. I give the text 5 stars for the limited role of providing a somewhat useful review of material. In general, an omitted comma may seem a insignificant. However, like the misplaced decimal, it does carry considerable meaning. Amazon advertised "Essential Organic and Biochemistry" next to "Fundamentals of General Oranic and Biological Chemistry". However, the cover title for the latter is "Funamentals of General, Organic and Biological Chemistry". Essentially, the "General" of the latter reads as the "Essential" of the former. The book was inexpensive. While it had fewer pages on the Organic and Bio Chem then I had hoped, it was probably enough for my needs. Not a biggie! Amazon is a first rate operation! Please keep in mind that punctuation matters. 5,0 von 5 SternenIt's a Book, and Probably Required. Got this for my fiancee for a basic chemistry class. She passed with an A. 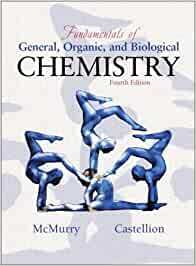 This book is a very good and comprehensive view of the basics in general, organic, and biological Chemistry. I also like the fact that the book gives many examples and problems to work with. I recommend the study guide which can be purchased separately to go along with this book as it has been a very useful tool for me in my effort to complete this course. Very helpful when paired with the book, it helped me understand the applied science and math with examples. 5,0 von 5 SternenWhat I wanted at a good price. Just what I was after. A good price with prompt shipping.